Personalization in marketing is a hot-button topic. It seems that no matter where you turn, there’s a marketer talking about web personalization. Are personalized experiences better at converting, or an invasion of privacy? What information do you need to collect, and where is the line crossed? Brands want a way to tailor content to their prospects and customers without overstepping boundaries and souring the experience, which has proven tricky in the changing landscape of visitor expectations. Web can have that battle. When it comes to mobile apps, there’s clear benefit, specifically in creating personalized app interactions (most notably push and in-app messages). Personalized notifications are the first step towards a completely personalized experience, and this kind of content customization is easier to do in apps than anywhere else. And unlike web visitors, app users have taken the time to download your app and opt-in to interacting more with your brand. Getting started with personalization now means being ahead of the game for what's coming in the near future. Read on for more on why personalization is going to be big in mobile, what's driving it, and why your brand should invest now. No two app users are the same, which is why one of the greatest sins in app marketing is sending every message to all users without first segmenting them into target audiences. Your users don’t want to be bombarded by app notifications; that lessens the value of your app – what they do want are targeted, contextual messages that benefit them in some way. A solid 50% of people say the #1 reason they download apps are to receive discounts and special offers. Personalization is fundamental to why this user base downloaded your app: to receive custom offers, rewards programs and other messages that are specific to their wants. Creating personalized interactions meets this critical user expectation, improving your app experience for users and your most important metrics. There are two forms of user data that will primarily inform your personalization strategy: behavioral data and profile data. Behavioral data: Gathered in-app, behavioral data represents all of the ways your user has interacted with your app over time, including sessions, screens viewed, conversions, push and in-app message opens, and funnel drop offs. Profile data: Profile data includes individual user attributes, such as location, gender, customer type, credit, email opens, and more, and includes user data gathered across every channel (including your app, in-store, online, email, and others). This combination of data gives you the ability to personalize your app marketing offers based on highly specific user personas, informed by all of your most important marketing channels. Take this use case: Sarah is the marketing manager for an eCommerce app. She wants to send an in-app notification to customers who have been granted a $20 credit when they put something in their cart. She could export this data from their EMM system, and pass it to her app marketing platform. There, she can create an in-app campaign for all of the users who have a $20 credit. Down the road, should she choose to be more targeted in her efforts, she could add to that segment users who have made an in-app purchase at least once in the last three months, combining profile and behavioral data for better results. There are a number of other ways this data can work together, but all of it serves to create a personalized experience based on app interactions and user attributes. Recently, we found that there’s a 60% chance users who don’t come back within 7 days never return, and yet a whopping 68% of people have enabled push notifications for their apps. The simple truth is that mobile users and ready and willing to interact, and the brands that are able to bring users back time and time again are the ones that see a positive ROI. Tailored content and personalized offers that speak to your audience are more likely to meet a specific need and drive users back to your app to convert, allowing you to engage them, consistently, over time. Loyal app users have a higher lifetime value and generate 25% more in-app purchases than less-engaged users, so use personalization to drive the loyalty that will make your app profitable. App personalization is evolving. Not too far down the road, we will see the ability for brands to alter the user experience and screen flow completely to suit personalization. Today, apps offer a unique and easy way to harness personalization with customized interactions. 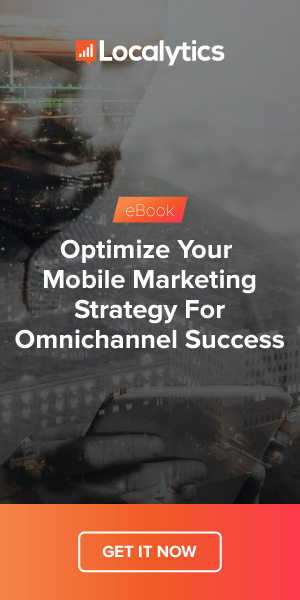 Once you have the data and marketing in place, mobile personalization is more of a reality, preparing you for the advancement ahead and putting you on par with the large companies leading the way now.